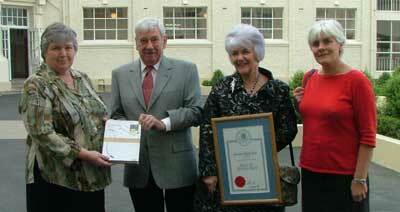 The 2008 Induction into the Hall of Distinction took place on Friday 30 June, 2008. 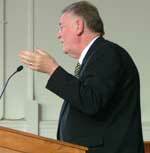 The MC was Bill Lake, former Deputy Principal of Selwyn College. Jack Bennett, Clif Reed and CK Stead have all had illustrious careers involving the written word and it is fitting that they have inducted at the same time. At School 1946 – 1950. Karl Stead is known by his initials, CK, or as Karl, a short form of his middle name. As a boy at school he was a debater and chorister, a swimmer and a member of the senior athletic team and a player in both the senior tennis team and the soccer First XI. He graduated MA from The University of Auckland in 1955 and completed a PhD from The University of Bristol, England in 1961. 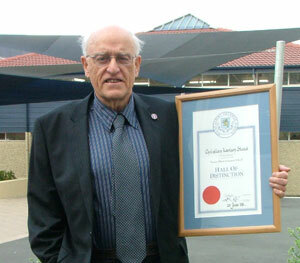 He taught at The University of Auckland and became Professor of English in 1968. He retired in 1986, the year after he was made a CBE. Emeritus Professor Stead is one of New Zealand’s most distinguished writers with a large body of work; essays, literary criticism, poems and novels, to his name. His 1971 novel Smith’s Dream was made into a motion picture, Sleeping Dogs . 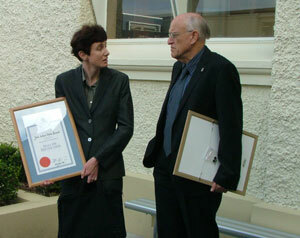 Two of his books, All Visitors Ashore (1984) and The Singing Whakapapa (1994), won the New Zealand Book Award. In 1995, he was elected a Fellow of the Royal Society of Literature, the following two years he was a senior visiting Fellow of St John’s College, Oxford, and in 2001 he was awarded an Honorary Doctor of Letters by The University of Bristol and won the King’s Lynn Poetry Prize. Since then he has written Kin of Place : Essays on 20 New Zealand Writers and a collection of poems, Dog , both in 2002. His Mansfield : a Novel (2004) and another collection of poems, The Red Tram (2004), were both short listed in the 2005 Montana New Zealand Book Awards. In 2005, he was awarded the Creative New Zealand Michael King Writer Fellowship. His novel My Name was Judas appeared in 2006 and his poetry collection The Black River appeared in 2007, the same year that he was made a Member of the Order of New Zealand, New Zealand’s highest honour. At School 1922 – 1924. AW Reed was known either as AW or Clif, a short form of his middle name. Clif Reed was one of the boys who came over from Auckland Grammar School to form the foundation pupils of Mount Albert Grammar School. He passed his Matriculation Examination in 1923 and he won the Reading Prize every year that he was here and he was the school’s Senior National Scholar in 1924. In 1925 he moved to Dunedin and began working for his uncle, AH Reed, who had sold his typewriters, stationery and books and was moving into publishing. In 1932 Clif was sent to Wellington to open a new branch, and he was made a partner in the business. From 1934 the firm was known as AH and AW Reed.In almost every home in New Zealand where there are books, the Reed colophon, the publishers mark at the bottom of the spine, will be somewhere in the bookcase. The intertwined raupo stems, one of New Zealand’s most distinctive corporate images, was designed by Clif. For 43 years, AH and AW, uncle and nephew, wrote letters to each other, often daily. Their letters are filed in the Alexander Turnbull Library in thousands of folders and they form the largest collection of private letters, by far, in New Zealand’s history. As well as running a publishing company, Clif was himself a prolific writer. In 2006, sixteen of his own books were still in print, some in Australia on Aboriginal themes and the rest in New Zealand on Maori themes. In his 2007 book Whare Roupo: The Reed Book Story, Gavin McLean remarked “Clif owed his start to his uncle, but the company (and New Zealand publishing) owes a far greater debt to Clif who took Reeds into mainstream commercial publishing”. Bennett on behalf of his son Edmund in England. Jack Bennett was in no way a sportsman. He was, however, a serious scholar and we still have copies of wonderful prize-winning essays he wrote in 1927 and in 1928. He is noted at school for writing something else, a poem called Envoi, published in The Albertian of 1928. The following year it was set to music. You will be familiar with it, the first line goes, “Dusk on the walls and the twilight lingering”. When Frank Douglas translated the three sung verses into Latin under the title Carmen Montis Alberti Ludi, Bennett, a proponent of the Latin Mass, would have found that interesting. Bennett was the School’s first Lissie Rathbone Scholar. This was an endowed prize for humanities and he was awarded it in English and in History. His Latin and French were pretty good, too. He graduated from the Auckland University College with first class honours in English and won a Scholarship to Merton College, Oxford University, and completed a second MA. Merton College elected him to a scholarship and he read for a DPhil degree. He completed that and he was later elected to a Fellowship at Queen’s College, Oxford. During World War II, he worked for the British Information Service in New York. After the war, he returned to his fellowship at Queen’s. In 1947, he was elected to a fellowship at Magdalen College, Oxford. In 1963. he moved to Cambridge University after CS Lewis (the author of the The Chronicles of Narnia) had died. Bennett was elected to Lewis’ professorship of Medieval and Renaissance English. In 1971 he was elected Fellow of the British Academy, a most prestigious honour.